We are engaged in designing an exquisite range of Tableware. 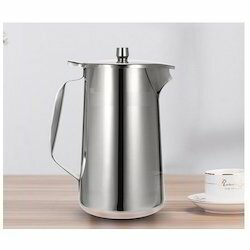 Under this category, we offer a wide assortment of Coffee Warmer, Regular Mug and Double Wall Mug to the customers. The tableware offered by us are widely used for decorating tables for providing the dining a pleasant experience. Used for keeping foodstuff and other items, these tableware can be availed by the customers in various shapes, sizes and designs as per their exact requirements. In order to fulfill the changing demands of our clients, we are offering a quality range of Regular Jug With Lid in mirror Polish. In order to fulfil the changing demands of our clients, we are offering a quality range of S.S Coffee Warmers. These are designed by the experts for elegance in conformation with the international standards. 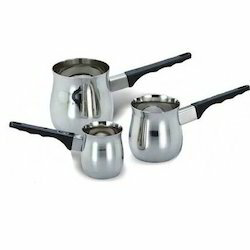 The offered warmers are widely used for heating coffee at a specific temperature. Moreover, we offer customization of these coffee warmers as per the specifications and needs of the customers. We make sure that only defect-free products are delivered at clients' premises within the stipulated time-frame. Being a customer-focused organization, we are engaged in offering a wide and exotic assortment of Double Wall Mugs. These wall mugs are ideal for serving any type of hot beverages. 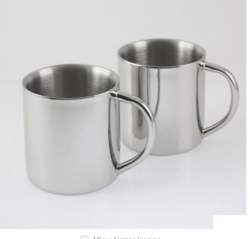 Offered by us in different designs and sizes, these mugs have double walls for perfect insulation for keeping the beverage hot for a longer period of time. Before the end delivery, these products are thoroughly checked by the quality analyzers on varied parameters to ensure their flawlessness. Looking for SS Tableware ?